Call them the Medusans. A billion years ago they ruled the galaxy, end to end and completely. Many artifacts, such as planetary outposts and derelict spaceships, are still being discovered, but the Medusans themselves are gone. Nothing remains but ruins, and in very rare cases, barely functioning and enigmatic machinery. Almost nothing is known about the Medusans themselves. Based on studies of their relics, it seems that they had a variable physical structure. Sometimes bipedal, other times quadrupedal, they may have been an amalgamation of many different races. Ruins have been found on more than a thousand worlds and full cities on hundreds. They seem to have been individually long-lived, but one day long ago they simply vanished. There is no evidence of war, or mass extinction, or plague, or even a galaxy-wide catastrophe. It is simply as if one day the Medusans quietly ceased to be. CGC 5314 IV is a galactic rim world. We are far out here, well off the archaeological beaten path. The stars are thin and dim and the Milky Way is but a path. The isolation can be hard but has its benefits; I welcome the lack of competition. And 5314 IV is rich in artifacts. One hundred years ago I staked my academic reputation on this world, and have been here since. Shauna was the best of my graduate students, the very cleverest I’ve known. I miss them, all my lost and scattered protégés, but I miss her the very most. Shauna was brilliant, a mathematical genius. She once confided that she hoped to one day decipher Linear A. I believe she might have. I had found the Medusan structure a year before she arrived. I had it almost completely unearthed, but I was unable to gain entry. 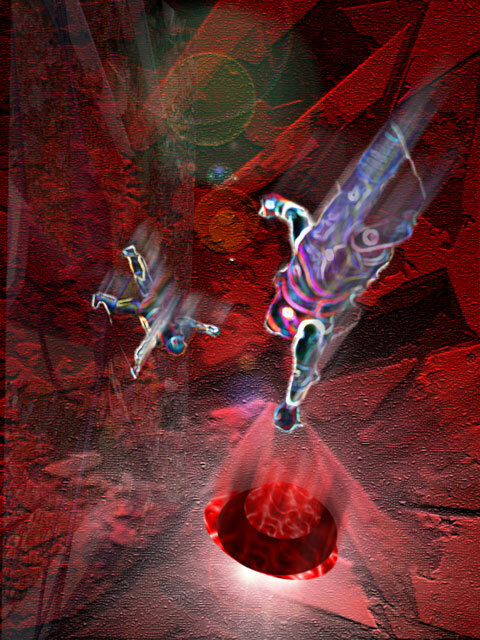 Shauna attacked the problem, developed what she called an “n-topic mathematical manifold, constricted”, and in six short weeks had determined a portal opening sequence. What we found inside was unlike any Medusan artifacts found before. Shauna called it a control room, took photographs, and headed back to her computers to make new manifolds. During the day she dug with me. In the evenings she tuned her computers. Late at night we would lie side by side in our sleeping gear, under the sparse stars, and talk each other to sleep. I remember her, the blanketing nights, and her dark eyes filled with sparkling stars. The rockslide was sudden and unforgiving. I was clear of it, upslope, but Shauna was dead in its path. She ran, I had called to her, but there was nothing to do. I found her two meters down. I was shaking, crying, desperate; I did all that I could. She was crushed, a bloody mess, one arm, one leg, and one side of her body mashed to pulp. I moved her, gingerly, back to our camp. I had expected her to die en route. The medcomp transfused her, sutured her bleeders, painkilled her to oblivion and pronounced her imminent death. Maybe with better care, who knows? Maybe the same result. I waited, a deathwatch, and after an hour the medcomp unexpectedly announced that she could be brought to consciousness. The original prognosis was unchanged, but we could have some final words. She knew and she didn’t pretend. I told her I loved her, I still do; I cried and apologized. And she demanded that I dump her main core notes into my wristcomp, and that I take her to the Medusan chamber. I argued, but there was no time to argue. I entered a sequence on the Medusan “keypad”, and a dais rose from the floor. Shauna had me put her on it. “Not a record writer…” she said weakly, “…a record reader, and understander… and…”. Her voice trailed off as I punched the last sequence. The dais settled back to the floor, then through it, and Shauna was gone. I was stunned. Time passed, minutes or hours, and finally a cylindrical column extended upward from the place where Shauna had lain. Atop was a gemstone, walnut sized, full of fire and ice and refractive color. Complex, perfectly cut, filled with synapses and double helices. I was alone then, for many years. Writing my papers, sending them back on the twice-yearly supply ship, receiving six months of journals at a time. Graduate students came and went. If they were bright I would show them some of Shauna’s notes, and hope for inspiration. Mostly I kept to myself. A few of the women wanted to screw a professor. Fine, unless it interfered with the dig. I’ll always feel badly about Clark. He was like a big kid, gawky and enthusiastic, and eager to work on his own. I let him – dammit, the laser diggers have fail-safes. I’ll never understand quite how it happened. But when I found him he had been dead for hours. The sand beneath his body halves was stained red with his blood. The medcomp told me he hadn’t suffered: he had probably gone instantly into shock and unconsciousness, hence his not summoning help. I will always blame myself – and I should. Again… into the Medusan chamber, still guarding its secrets. The same sequence, and Clark’s cold body was gone and replaced with a brilliant gemstone. I felt cursed. I had lost two people in sixty years on a small dig. Thanks to geriatric treatments, we don’t die often, and then usually by accident. Main core tells me that archaeology is dangerous, and that two deaths in the given span are at the expected level, but that is little comfort. And even as I dug sands and rock during the day, I dug through Shauna’s notes at night. Years later, I was still trying to understand it all. In her short time here she had given me decades of material to puzzle over. Shauna had developed problem-solving routines for gaining access to Medusan chambers, but none were adequate to the task of deciphering the various chambers’ functions. Then came Jill, the third and final jewel in my bracelet. She was bright, maybe as bright as Shauna had been. It was Jill who helped me put my ill-formed beliefs about the Medusans onto an evidentiary footing. I showed her all of the notes; I shared all of my guesses; I showed her the gems. We tried the lover angle but it didn’t work for us. Instead, we were great friends. She was my last graduate student. I have accepted none since, and will not again. Jill picked up my bracelet and touched each of the two crystals. I have to believe, I need to believe, that Jill was right, and that Shauna guessed correctly. Jill affirmed what I had long-suspected. Against my protests, she performed various crystallographies on the gems. She determined that they had a Mohs scale hardness exceeding ten, harder than diamond. Jill spent three years here. I am happy to carry her not on my wrist but in my memory and her departure was a sad occasion of well wishes. None have come after her and in a deep way the universe has moved past the Medusans and past me. I dig each day, and sometimes when I pause to rest I think… and I think that a very long time ago the Medusans built God-like machines. Machines so powerful that they could record the informational structure of life. I hope that this was not all, that these machines could do more. Jill believed, and Shauna believed, and I want to believe, that the chambers could read battered flesh, maybe even dead flesh, and record it not as it is but as it was when it was healthy. And so, each chamber I uncover, I enter and key the dais-raising sequence. I hold my breath and hope not for a platform, but a simple shelf on which to place my gems. I must believe that information preservation implies information recovery. I must believe that someday, my gleaming jewels can live again. And on bad days I ask myself, why then did the Medusans disappear, and these vast machines still working yet implacably crumbling to dust? Surely elsewhere there is a record. Surely each jewel is only a backup – maybe no more than a token. Perhaps Clark and Shauna and the Medusans themselves live in a computer simulation, in a dying computer, which begs the question of poor planning. There is a way to know for certain, to lie on the dais and key the sequence… for now, I keep digging. One day I will make a choice; for now, I keep digging. About the author: Bill Suboski was born a Hoosier, been a Buckeye awhile, with time spent as a Canuck. He likes to read and write. About the author: Romeo Esparrago is a jewel of an artist.